You know I love color, and I really think one of the best and easiest places to play with color is in your workout wear. 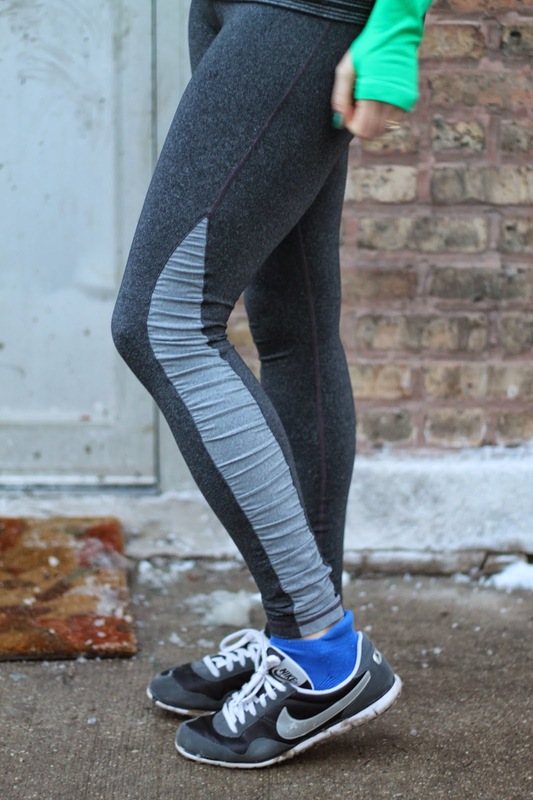 I live by a no-rules motto when it comes to how I put together my workout attire. In fact sometimes the more colors/patterns I can squeeze into one outfit, the better. This is a fine example with this green and gray combo. The tank is striped, the pants are two-tone and then you have these crazy blue socks. They may look a little loud but I don't mind because they actually serve a purpose. They are the newest color of the official Bar Method grippy socks that they sell in the studio. Basically I only ever buy their expensive socks when I have forgotten my own. I'm not gonna lie, they are way more comfy and helpful in preventing my feet from sliding and heels from aching on the bar with their tiny cushion backs. So I'll gladly display them as a little "feet treat".